By Clemente Lisi – Rio de Janeiro, BRAZIL (July 13, 2014) US Soccer Players – Brazil had a reason to rejoice after all. Losing to Germany in one of the most-lopsided World Cup semifinals ever had been bad enough. A trouncing by the Netherlands in the third-place match was also not what anybody expected. The possibility of Argentina winning the trophy on its home soil Sunday at the famed Maracana . . .
By Clemente Lisi – Rio de Janeiro, BRAZIL (July 11, 2014) US Soccer Players – World Cups are loaded with exciting moments and unexpected outcomes. Great goals and individual skill highlight this team sport and the 64-game carnival that is the 2014 World Cup. However, all these ingredients are not necessarily meant to describe the World Cup’s most important game. The World Cup final - like . . .
Is this the counterattack World Cup? By Jason Davis - WASHINGTON, DC (July 11, 2014) US Soccer Players - The 2014 World Cup is a World Cup of surprises. This is a World Cup of goals, both in quantity and quality. This is a World Cup of defensive failure, but also of offensive brilliance. The two combine to produce a cocktail of entertainment and drama that makes this edition of the World Cup one of the best ever to watch from afar. . . .
By J Hutcherson - WASHINGTON, DC (July 8, 2014) US Soccer Players – So there Brazil was, struggling in the group stage against Croatia and Mexico. The evidence was already there, the problems already causing concern for the home fans. Needing penalties to get past Chile at the Round of 16, a return to form in the quarterfinals against Colombia cost them their superstar. Neymar was out, and Brazil . . .
By Jason Davis - WASHINGTON, DC (July 4, 2014) US Soccer Players - The 2014 World Cup is over. Not for the eight teams still alive with a chance to lift the trophy on July 13th, but certainly for everyone else. That means that it’s already time to start over for most of the soccer world. The new World Cup cycle begins the moment the previous one ends. That means it’s time to start working towards . . . The USMNT exited the 2014 World Cup with a Round of 16 loss to Belgium in Salvador. With the USMNT absorbing significant pressure from the Belgium attack, the game ended scoreless in regulation. Belgium midfielder Kevin De Bruyne scored in the 93rd minute and Romelu Lukaku added a second goal in the 104th. 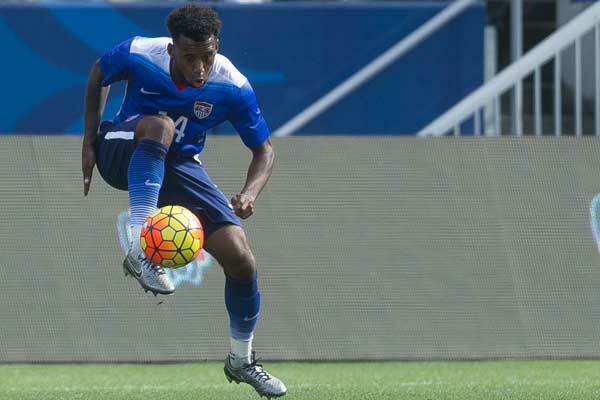 Extra time substitute Julian Green pulled a goal back for the USMNT, scoring in the 107th . . .
By J Hutcherson - WASHINGTON, DC (July 1, 2014) US Soccer Players – The Belgium vs USMNT Round of 16 World Cup game didn't set a new mark for style of play. However, it did demonstrate that the USMNT can add to the frustrations of a good team that can't quite connect. For 90 minutes, the USMNT made it more difficult for Belgium, and that certainly counts. Belgium Crosses It's tough to criticize . . .
By J Hutcherson - WASHINGTON, DC (June 30, 2014) US Soccer Players – Belgium and the USMNT meet in the 2014 World Cup Round of 16 at Salvador's Arena Fonte Nova. Both teams will already know if they'll meet Argentina or Switzerland from Tuesday's early game (12pm ET - ESPN). Scouting any team coming out of the group stage is difficult, but Belgium compounds the problem. Belgium coach Marc Wilmots . . .
By Clemente Lisi – NEW YORK, NY (June 27, 2014) US Soccer Players – The opening round of the 2014 World Cup has come to an end. The USMNT is off to the Round of 16, where on Tuesday they will take on Belgium. As a result, interest in soccer appears to be at an all-time high in the United States. Local bars are filled with chanting fans and Tim Howard and Clint Dempsey have become part of water . . .
Is CONCACAF the biggest surprise of the 2014 World Cup? By Jason Davis - WASHINGTON, DC (June 27, 2014) US Soccer Players - By virtue of the USMNT advancing to the Round of 16 on Thursday, CONCACAF - perhaps the world’s most lightly regarded confederation not named Oceania - will have three representatives in the knockout rounds of the 2014 World Cup in Brazil. Only Honduras failed to escape their group. Though the Catrachos sullied the region’s . . .